My friend lent me He Said/ She Said and it took me a while to get round to reading it. I’d never heard of the book or Erin Kelly before and the blurb didn’t particularly excite me. I read it straight after Eleanor Oliphant is Completely Fine, which was a really tough act to follow. I thought I was going to be disappointed in whatever I read next. But I’m pleased to say that I wasn’t. Far from it. In 2015, dedicated eclipse chaser, Kit, is heading north to catch the total eclipse. His wife, Laura, heavily pregnant with twins, stays at home. They are both terrified that he will be tracked down by the person they’ve been hiding from for 15 years. Kit and Laura had changed their identities and were careful never to appear online. What had frightened them so much? Shortly after they 1999 eclipse, they’d witnessed the aftermath of a brutal attack. At that moment, it wasn’t just the victim’s life that was changed forever. Laura knew what she had seen and was willing to stand up in court and say it. But at what cost? Told alternately by Laura and Kit and going backwards and forwards between 1999/ 2000 and 2015, He Said/ She Said is full of twists and turns. Why had they been hiding for 15 years and how had a friendship turned so sour? I really enjoyed this book and had no idea how it would turn out or why Kit and Laura were so afraid. It was completely different from Eleanor Oliphant and firmly back in my comfort zone of the psychological thriller. 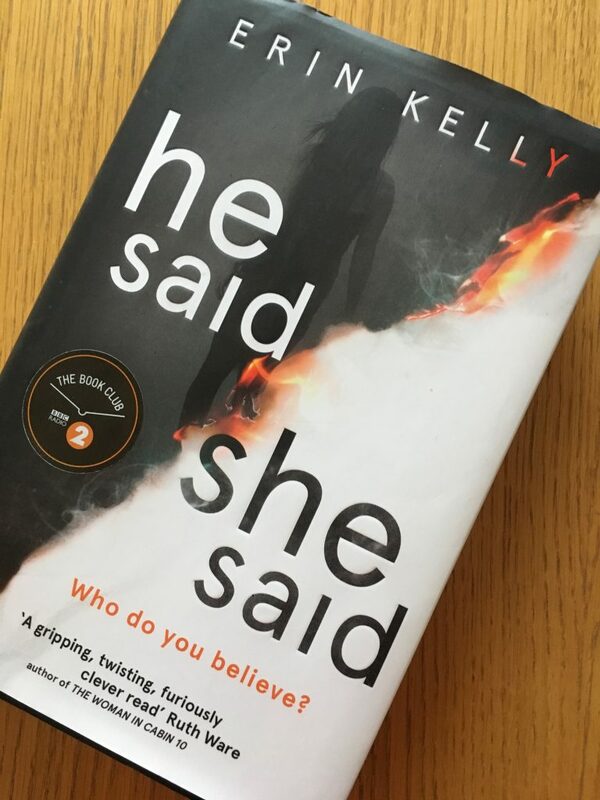 If you enjoy a psychological thriller as much as I do, I would definitely recommend He Said/ She Said. And if you’ve never tried a psychological thriller before, this could be a good place to start. It helpfully tells you who is talking and when they’re talking, so it’s not too confusing! It’s well worth a read! It came out in paperback recently, so worth looking out for it. I do too! This is a really good read and I like the unusual backdrop of the eclipses. It’s definitely worth a read! I think at least half of the books I read are psychological thrillers, I love them!